Does your business website run on WordPress? Over a quarter of all websites worldwide are powered by WordPress, so yours is probably too! If you employ staff and your digital presence matters to your business, then it’s important that everyone in your team be trained to use WordPress effectively. As we explain in The WordPress Paradox, almost every aspect of WordPress can be managed by non-technical users. This means that anyone in your team can contribute to the growth of your business and help save money on the cost of hiring experts to look after areas like digital management and digital marketing. Publish content online to promote your business, drive more traffic, and generate more leads to your website. Add new pages and posts, edit existing content (e.g. pages and product descriptions), upload PDF files, images, videos, etc. Manage, maintain, and keep everything in your website up-to-date, fully backed-up and protected from hackers and malicious users without touching any code (most of this can even be automated). This includes the core software, files, database, plugins, themes, content, pages, uploads, users, etc. Add new functionality to your website (e.g. add e-commerce, newsletter signup forms, advertising banners, a membership site or directory, contact forms, image or video galleries, etc.) with a few clicks of the mouse using free or inexpensive plugins. Change your web design entirely with a few clicks of the mouse using free or inexpensive themes. Rearrange, tweak or improve the layout of your website and reconfigure user navigation menus in your site’s header, footer, or sidebar areas to improve visitor and user experience with a few clicks of the mouse using drag and drop widgets. Test, improve, and automate marketing processes (e.g. SEO, traffic generation, list-building, sales conversion, etc.) and generate useful business and website reports (e.g. analytics, social engagement, etc.) using plugins and services that integrate easily with WordPress. Training your staff to use WordPress effectively also saves your business time and money in areas like outsourcing, web development, web design, and technical support and helps to improve business efficiency, get better results online, boost team productivity and increase your competitive advantage. Teaching and training people to use WordPress effectively, however, can be very challenging. As we explain in The Challenges Of Educating, Teaching, And Training New WordPress Users, although website developers are responsible for providing clients with training on how to use their new websites, they are often not the best people to train new WordPress users. Training is not their core business and they have no incentive to fully train and empower clients to manage their own websites. As a result, many new WordPress users do not receive the kind of training that would help them get the most benefit from using WordPress and their websites end up being significantly underutilized or costing more money to maintain than it should. You can spend hundreds, even thousands of dollars on WordPress courses and digital skills training for your staff … or use WPCompendium.org! At WPCompendium.org, we have invested many years into building a comprehensive FREE WordPress training system focused on helping non-technical users and small businesses grow a successful digital presence using WordPress. We provide hundreds of detailed WordPress step-by-step tutorials that you can use to train your staff to build, grow, manage, and automate your digital presence with no technical skills required and we’ll show you how to do all this at minimal cost … for FREE! In addition to our detailed guide on how to effectively train new WordPress users, we have also created the practical 7-step training program below that will teach you and your team how to use WordPress … completely FREE of charge! Train Your Staff How To Use WordPress In 7 Days … For Free! This WordPress training course is entirely self-paced. It consists of 7 practical lessons that can be completed in the user’s own time and convenience. Just refer members of your staff to this page and ask them to complete the training program below. After a staff member has completed the tutorials and the action steps in the training program, they will not only have the knowledge, skills, and competence to perform tasks in vital areas like digital content publishing, digital management, and digital marketing, they will also know where to come to find answers and to keep learning about more ways to help your business grow online. Make sure that you have admin access to your WordPress site so your staff can perform all of the tasks included in the tutorials. For security purposes, we recommend creating new user accounts for training new members. Ideally, your WordPress site would have been expertly configured to automate processes like backups, search engine indexing, social media marketing, etc. Not all website developers will do (or can do) this when they set up your website. An expertly configured WordPress site will automatically get your pages indexed on search engines and instantly syndicate your content on social media and other authority sites as soon as new content is published, and automatically perform other management and marketing tasks, like backups, add new subscribers to your list, etc. Make a complete backup of your WordPress site before allowing anyone to access your site’s admin area. See this section if you need help automating WordPress backups, or install a plugin like Backup Creator to perform 1-click backups. Optional: The businesses that get the best results online are those that are in complete control of their digital presence. To learn why most businesses are not in control of their digital presence and how to avoid this, we recommend downloading an e-book we have written specifically to help small businesses called The Small Business Digital Manager. Hello and welcome to our 7-part course on using WordPress. By completing the training below, you will gain valuable new digital skills and be able to better contribute to the growth and success of your team. This course is easy to follow. Everything is explained using plain and simple language. No technical knowledge or coding skills are required. If you have basic computer skills and can click a mouse button or tap on a screen, you can master using WordPress with our training and our tutorials. All you need to do is go through the course below and complete all of the step-by-step tutorials and action steps. All the help and information you need is right here on WPCompendium.org. We’ve got hundreds of detailed step-by-step tutorials that you can refer to anytime you need help or want to know what to do next. Goal: Learn about the benefits and advantages of using WordPress to manage and grow a business online. The more you learn about WordPress and what you can achieve with it, the faster you will be able to help your business solve problems online, overcome challenges, and get better results like driving more traffic and generating more leads, more sales, more subscribers, etc. WordPress is more than just a website or a blogging platform. It’s a digital vehicle that can take your business anywhere it wants to go. WordPress lets you build just about anything you can imagine online with no technical skills required … all you need to do is learn how to drive it! Just like learning how to drive a vehicle involves learning lots of little steps until everything becomes automatic, learning how to get from where you are to where you want to go online with WordPress also involves learning lots of little steps until it too becomes automatic. The first step, then, is to learn more about WordPress and where all of the work gets done in your WordPress site. How to use and navigate around WPCompendium.org. The benefits of using the WordPress Content Management System (CMS). How to log into WordPress. Complete all of the tutorials listed below. Log into WordPress and learn how to navigate and use the WordPress dashboard (ask your manager for your login details). Install WPCompendium.org’s Chrome browser add-on (if you use Google Chrome’s browser, this free extension will bookmark the tutorials on your browser for easy one-click access). Visit our Quick Start section (use this section until you are familiar with how to navigate around this site). Visit this section to learn how to navigate around WPCompendium.org and find the information you are looking for quickly. Feel free to explore any of the other tutorials in the WordPress Overview training module. Explore content links in the above tutorials to learn more (clicking on links in the content will open up new tutorials in separate browser tabs). Know how to use this site to find answers about WordPress. Have a better understanding of the benefits and advantages of using WordPress. Know how to log in and out of WordPress. Know how to navigate inside your WordPress dashboard. Have installed the Chrome browser extension (if you use Google Chrome) so you can come back to these tutorials anytime with one click of a button. Goal: To assemble the information you will need to publish content on your website. In the Digital Information Age, content is not only ‘king,’ it’s also the global currency we use to communicate and transact online. Businesses needs lots of digital content. Your business needs content for its website pages, blog, newsletters, product descriptions, post headlines, sales copy, social media, ads, articles, promotional pieces, news releases, customer training, FAQs, forum discussions, SEO meta descriptions, etc. Train new clients, staff members, customers, subscribers, users, resellers, affiliates, etc. Knowing how to create and produce good quality content, therefore, is one of the most valuable skills you can develop to grow your business online. In this lesson, you will learn how to prepare content to create a quality article or blog post to publish online with WordPress. Why content marketing is important. Tools that can help you organize your content ideas. Tools that can help you write content more effectively. How to never run out of content ideas for a website, blog, or social media. Come up with an effective title (headline) for your article. Create a 500 – 1,200 word article and save it as a text file. Source media (e.g. images, videos, etc.) for your article. Subscribe to our FREE Content Creation Email Course. Go through the tutorials in our Content Marketing With WordPress series. Learn How To Store, Plan And Organize Your Content Ideas. Use these Fast Content Idea Generation Tools to come up with initial content ideas for your article and article titles. Learn Where To Source Free And Royalty-Free Images For Your WordPress Site. You understand how to navigate and find information on WPCompendium.org (see Lesson 1 tutorials). You understand the difference between WordPress Posts vs WordPress Pages. You have created an article for publishing online. It doesn’t need to be formatted (i.e. plain text copy will do). If you have written your article using a word processor application (e.g. MS Word) that’s OK.
You have a title or headline for your new post or article (see Lesson 2 tutorials). You have sourced images, videos, etc. for your article. If you don’t have any original images or videos, don’t worry. See the tutorial for sourcing free images and just find a video related to your topic on YouTube. You have subscribed to our FREE Content Creation Course (you can also download the entire 120-lesson course as an e-book here). Congratulations! After completing Lesson 2, you should have everything you need to publish content on your WordPress site in our next lesson. Goal: To learn how to publish content on your WordPress site. Businesses that understand the value of using content to get results online, take content marketing seriously, and get results online publish new content regularly. Lesson 2 was all about learning about the process of creating, producing and publishing content and implementing systems to turn new content ideas into published content. In Lessons 3 and 4, you will learn how to publish a web article or blog post on your WordPress site. How to create a new Post in WordPress. How to add a post title and content. How to format your post content using the WordPress visual editor. How to add a post excerpt. How to edit and update your content and republish your article or blog post. Create a new WordPress post. Add and format your content. The tutorials in the above sections will take you step-by-step through the entire post creation and publishing process. For this lesson, just focus on adding a text-based article or blog post to WordPress and learning how to publish it. In Lesson 4, we’ll go through the tutorials on editing your content and adding images and videos. As stated in the introduction section, this training assumes that your business already has a WordPress site set up and professionally configured (you can learn how to do this yourself using our Free WordPress installation and WordPress configuration tutorials, but this is your website developer’s job). Permalinks – This creates SEO-friendly URLs for your posts and pages. If configured correctly, there’s nothing you need to do here. Your post will automatically publish with an SEO-friendly URL. Post Categories – If post categories have been set up correctly for your site, all you need to do is select the category that best fits your post before publishing. If no category is available, see our tutorials to learn how to add a new post category to WordPress. Post Tags – This a built-in feature of WordPress. All you need to do is add relevant tags to your post before publishing. 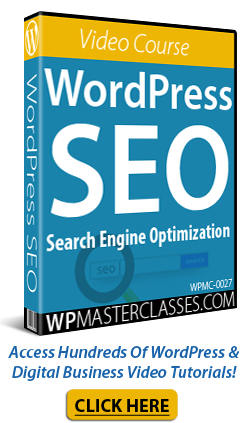 SEO Plugin – With an SEO plugin installed (e.g. Yoast SEO), you can ‘instruct’ sites like Google, Facebook, Twitter, etc. how to display your content in their search results, post feeds, RSS feeds, etc. Content Syndication – If your WordPress site has been expertly configured, your posts should automatically appear on your social pages (e.g. Facebook, Twitter, LinkedIn, etc.) Note: not all website developers will set this up (you can learn how to do it yourself with these tutorials). Congratulations! After completing Lesson 3, you should now know how to publish a new article or blog post on your WordPress site and how to optimize your post or page for search engines. Goal: To learn how to edit content and add media to your posts and pages. WordPress makes it easy to edit published content and add media elements like images, videos, audios, etc. How to edit WordPress posts and pages. How to add an image, video, or audio file to your content. Edit the WordPress post you’ve created in lesson 3. Add an image, video, or audio file to your content, etc. Save and republish your content. These tutorials explain how to upload media to WordPress using the WordPress media library. You can also store media on external or cloud storage solutions (e.g. Amazon S3, Dropbox, Google Drive, etc.) and add these to your WordPress posts. Congratulations! After completing Lesson 4, you should now know how to edit content on your WordPress site and add media elements like images, videos, audio files, etc. to your posts and pages. Goal: To learn how to expand your WordPress site’s functionality and capabilities. WordPress plugins let you easily enhance, extend, or expand the capabilities of your site in almost limitless ways. Whatever you can imagine doing online, there’s probably a WordPress plugin available that will let you do it. Make a full backup of your WordPress site. Install WP TrainMe User Tutorials Plugin (FREE). Install a WordPress plugin for adding table to your content (FREE). Review additional useful plugins for your website. Before installing any plugins on your WordPress site always make a complete backup of your WordPress software, files, and database. This way, if anything should go wrong, you can easily restore your website. Backing up your entire WordPress site only takes a few seconds. Whether you decide to install new plugins or not, you should have a website backup system and your website developer should already have set this up for you. TablePress – Click on the tutorial to learn how to install a plugin that lets you add tables to your WordPress posts and pages. WPTrainMe WordPress User Tutorials Plugin – With the WPTrainMe plugin installed, you can access all of the tutorials on WPCompendium.org plus WordPress video tutorials from inside your WordPress dashboard. Let’s install the FREE version of the WPTrainMe plugin, which gives you access to all of the tutorials in our How To Use WordPress training module, plus related video tutorials. You can upgrade later to the PRO version and get access to hundreds of video tutorials. In your dashboard, go to Plugins > Add New. Enter wptrainme in the search box. Enter your membership login details in the ‘Settings’ tab of the plugin to authenticate and begin using the plugin. Congratulations! After completing Lesson 5, you should now know how to enhance, expand, and extend the functionality of your WordPress site using plugins. Widgets, shortcodes, and custom menus give you control of your WordPress site’s layout and functionality without requiring any technical knowledge or coding skills. Widgets let you redesign areas of your site’s templates like the header, footer, or sidebars using drag and drop. Shortcodes let you easily insert complex elements like scripts into your content by simply typing in special words into your content inside square brackets (eg. [shortcode]). Custom menus let you improve your site navigation by adding (or excluding) selected pages, posts, URLs, etc. What a WordPress widget is and what it does. How to use and configure WordPress widgets. How to rearrange the layout of your WordPress sidebar, header, footer, etc. using widgets. What shortcodes are and how they work. How to use shortcodes to add functionality and other elements to your WordPress posts and pages. How to use and edit WordPress menus. Add some useful sections to your website using widgets. Add a table to your article or blog post using shortcodes. How to use and configure widgets in your WordPress site’s sidebars, header, and footer areas. How to add shortcodes to content in your WordPress posts and pages. How to customize, add, and edit links in your WordPress menus. Goal: To learn how to perform basic WordPress site maintenance on a regular basis. All websites require maintenance for security and improved performance. WordPress is no different. Learning how to keep your WordPress site maintained, fully backed up and updated on a regular basis will not only save your business money on support costs, it is also essential for the peace of mind and security of any business with an active web presence. The importance of keeping your WordPress site maintained, fully backed up, updated and secure. How to perform a simple WordPress maintenance routine in 5-10 minutes. The importance of keeping your WordPress site optimized. Issues that affect WordPress security. How to troubleshoot common WordPress errors. Learn how to test your WordPress site’s mobile friendliness. Learn how to perform a basic WordPress security audit. Where to get additional WordPress help and support if needed. Congratulations on completing our WordPress training program! We hope that you have learned a lot. Hopefully, now you have a better idea of just how powerful WordPress really is and how much you can do without having any technical knowledge or coding/web programming skills. Once you master the basics of using WordPress, there is no limit to what you can do! We provide hundreds of FREE WordPress step-by-step tutorials for non-techies, including tutorials on how to drive more traffic, generate more leads, get more subscribers, monetize your site, and grow your sales online in our WordPress Business Strategies training module, which is also 100% FREE! We encourage you to keep learning all you can about using WordPress to help your business grow online and come back to WPCompendium.org whenever you have any questions or want to learn more about WordPress. Stock images used above are licensed from Shutterstock and iStockPhotos. WPCompendium.org provides hundreds of detailed step-by-step WordPress tutorials for non-techies … 100% Free! Many website owners are non-techies. They are businesses and bloggers who want a digital presence that will deliver them better results online, help them create more exposure online, drive more traffic, get more leads, more customers, more subscribers, make more sales, and gain a competitive advantage without having to become web developers or learn how to code. Your business needs a digital presence to grow and compete successfully in the Digital Information Age. Non-technical website owners, however, can’t afford to have a digital presence where every aspect of using, managing, or growing your business online requires employing people with technical skills to do things for you. Outsourcing every aspect of your digital presence is not only expensive, it can also be risky and frustrating, as you can end up with no control over your own processes and have to wait for even simple things to get done. Most non-techies hire website developers to build their websites and expect to be trained by them on how to use their sites. As we explain in The Challenges Of Educating, Teaching, And Training New WordPress Users, however, clients shouldn’t expect to receive training that will empower them to have control of their own web presence, as this is neither their core area of expertise, nor is it in their best interest to do so. As we explain in The WordPress Paradox, the current web services industry is not designed to empower non-technical users, it’s designed to keep users dependent on technical service providers. And as we explain in the Small Business Digital Manager, many small businesses outsource their digital management and digital marketing without systems in place to control and manage their digital processes, and end up either with an unmanageable web presence, or being held “hostage” by their digital service providers. If you are not technical-minded and want to learn how to grow a business online without having to learn how to write code and without having to depend on technical experts for everything, what you need, then, is training that will show you step-by-step what to do to get better results online and empower you to be in complete control of your web presence. This is why we created WPCompendium.org. Our FREE tutorials will take you step-by-step through the entire process of building, managing, and growing your own web presence without technical skills and at minimal cost. Without the keys to drive your vehicle, however, you’ll be stuck whenever you want to drive your business forward or get anything done. It’s like owning a car but constantly needing the help of mechanics and chauffeurs to use it. WordPress education and training are the keys that let you drive your vehicle without depending on technical people like website developers, web designers, etc. That’s why WPCompendium.org provides hundreds of comprehensive WordPress tutorials for FREE that show you step-by-step how to be in complete control of your web presence and how to get better results online without technical skills and at minimal cost. Everything you see on WPCompendium.org has been built and configured by a non-techie to help other non-techies learn how to build, manage, and grow a successful digital presence without having to mess with code or learn how to program. This site attracts thousands of WordPress users from all around the world every month using a default ‘out-of-the-box’ free WordPress theme and free or very inexpensive WordPress plugins to automate management and marketing processes. We have not employed website developers, web designers, or web coders to install, configure, manage, or grow any aspect of this site. We have purposely done things this way to make sure that other non-techies can duplicate the same processes using WordPress and achieve great results online too. We know that most businesses are run by non-techies who want a digital presence that will deliver them maximum results at minimal cost. We have spent years documenting how to start and build a professional business website that can be fully managed by a non-technical user. Our step-by-step tutorials are simple to follow and will save you years of learning and trying to figure things out for yourself. What does this WordPress function or feature do, how does it work, and how can it help non-technical users achieve desired results and grow their business? How do we explain the benefits of using this feature or function so non-techies can understand and apply it to their own sites? Where do all the buttons, links, options, settings, and sections connected to this WordPress function or feature lead to, how do they work, and what purpose do they serve? How do we explain all this in non-technical terms? What is the most cost-effective way to get results in this area of WordPress and are there any processes that can be automated? If so, how? How far can a non-techie go on their own in this area of WordPress without having to hire or outsource technical experts or technical service providers? Non-Techie WordPress User? You Can Do It! Visit any online discussion group for website developers and you will see that many web service providers believe that non-techies should not build, manage, or mess with their own websites because they will stuff things up if they do. The problem with this belief is that it not only comes from a place of disempowerment, it’s also driven by self interest. We are not discouraging businesses from outsourcing to website developers and technical service providers. Our aim is to help businesses make informed decisions by understanding that outsourcing is a choice, not a requirement. The people they normally turn to for help or advice (e.g. website developers) have no incentive or motivation to educate, encourage, or empower them to do it all themselves. The good news is that if you are a non-techie who would like to learn how to build a successful online presence, you can do it … just follow our step-by-step tutorials! WPCompendium.org contains hundreds of written step-by-step tutorials with loads of instructive screenshots and links to related tutorials. If you don’t know where to start, the quickest and easiest way to get started on WP Compendium.org is by visiting our Quick Start section. If you have an idea of what you are trying to achieve, then you can easily find a tutorial by learning how to navigate this site, or clicking through to one of our WordPress training modules. Introduction To WordPress – If you still don’t know what WordPress is or why you should use WordPress to power your website and drive your online business, then go through the tutorials in this training module. These will take you through the benefits and advantages of using WordPress, costs of setting up a website, who uses WordPress, and more. Website Planning – The tutorials in this module will show you how to plan your new website and what you need to do before getting your new site built. WordPress Installation – The tutorials in this module take you step-by-step through the process of installing a WordPress site or blog on your own domain, including how to set up your domain, web server, etc. WordPress Configuration – The tutorials in this module show you how to configure your WordPress site to drive more web traffic and get your pages indexed by search engines automatically. 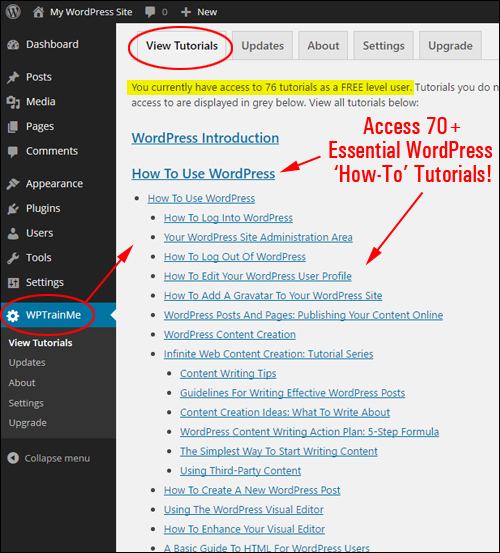 How To Use WordPress – If you already have a WordPress site set up, the tutorials in this module show you how to use WordPress and all of its main features. WordPress Plugins – The tutorials in this module show you how to expand, enhance, and extend the functionality of your site in almost limitless ways. WordPress Customization – The tutorials in this module show you how to easily customize your website design and other aspects of your WordPress site. WordPress Management – This comprehensive training module includes all of the tutorials you need to know how to manage your WordPress site and maintain your site updated and fully backed up. WordPress Optimization – The tutorials in this module show you how to optimize WordPress for improved speed and better performance. WordPress Security – This comprehensive training module not only includes tutorials on how to improve WordPress security and protect your site from hackers and malicious users, but also how to ensure that all areas of your digital presence remain protected too! WordPress Business Strategies – After your WordPress site has been built and configured, it’s time to grow your business online. The tutorials in this training module show you many different ways to monetize and promote your website, including ways to generate more traffic, drive more targeted prospects and leads to your site, convert more visitors into new customers, sales, and subscribers, gain a competitive advantage online, and more! We have developed a WordPress user tutorials plugin that lets you access all of the written tutorials on WPCompendium.org plus hundreds of WordPress video tutorials from your own WordPress dashboard. You can also access our FREE WordPress tutorials for non-techies any time you need help learning WordPress by installing our FREE Chrome Browser Extension. We hope that you have found this information useful and we wish you the very best of success online! Press Release – WPCompendium.org offers expert guidance & step-by-step advice on how to improve your business web presence. Learn WordPress with no coding skills required. A WordPress tutorials for beginners website showing site owners how to get the most from their WordPress site regardless of experience has celebrated the launch of its 320th tutorial. WPCompendium.org offers expert guidance and step by step advice on how to improve a business’s web presence, and the site owner doesn’t need any coding skills or technical expertise to start, grow, or manage their site. More information can be found at: https://wpcompendium.org. Free WordPress tutorials for beginners are broken down in an easy to read way on the WPCompendium site, allowing businesses to save thousands of dollars on web development and digital marketing costs. The learn WordPress step by step tutorials cover a wide range of topics, ensuring that site owners across any business niche can use them to their advantage. The site explains that tutorials cover every aspect of using WordPress, with topics ranging from an overview of the features and benefits WordPress offers as a platform, to planning, installing and configuring a site from scratch. In addition to this, step by step WordPress guides are available on finding, installing and running plugins, as well as managing the site and customizing all of its options. The site emphasizes that business owners looking to learn how to use the platform and get the most out of their business without buying guides or ebooks can rely on WPCompendium. Because WordPress changes so quickly, books can quickly go out of date, but online articles and guides like those found on WPCompendium.org will always be up to date. Each tutorial available on the site is broken down into modules, so site owners can browse for the category they want to get help with and delve into a series of articles on a range of different topics.